For those of you homeschooling your children in English, there are plenty of programs out there for teaching your child to read. This is our experience: Because my daughter is English dominant, I decided the easiest thing to do was to teach her to read in English. She had already learned the alphabet and sounds in the (English-)only nursery school in the area. The curriculum I was using was a little slow, not fast paced enough for my daughter. 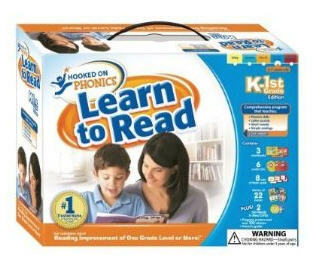 So I followed the advice of a friend and picked up a set of Hooked on Phonics Learn to Read K-1st edition. I'm so glad I did. At first I wasn't sure I liked it because it seemed too structured. Children are provided with a workbook and a CD, as well as some flashcards and books. A lesson basically starts with the child listening to the CD and following along in the workbook. There is great emphasis on repetition. Students focus on ending sounds ("at", "en", "ig", etc.) and work their way through a page with a short list of words. Afterwards, they may read a short story in the workbook, or an acutal small book that they can color afterwards. Some spelling games are mixed in with the book, building on the letters and sound combinations that have already been mastered. And the program also works in sight words that are not easily sounded out. My daughter had a little trouble with these. So we have worked on them in different ways. The set comes with a reward poster and children can keep track of their progress by putting stickers on the title of each story after they finish reading it. So like I said, I though it would be too structured ("do it this way"), but I was amazed to find that it worked and that my daughter actually enjoyed it. She zipped through the Kindergarten edition in about 3 months or less and then we started the 1st grade level. It is divided into 2 sections and we finished the first in about 4 months or so. There did seem to be a bigger jump between the two levels than what I thought there should be, so we took it slow and worked on it with a lot of patience. Overall, I found this particular program worked well for my first child. But I did discover that teaching a child to read is much more difficult than I anticipated it to be. She easily got frustrated if I pushed too hard or expected too much. I had to remind myself that even though this was easy for me, it was all new to her. Tomorrow: Tips on how you, as a parent/teacher, can make your child's learning-to-read experience more enjoyable!